Opening Times: Monday - Friday 9.30 – 6pm, Saturday 10 – 4pm. The opening of Japan following the military expedition of the USA's Commodore Perry in 1853, gave rise to an international market dealing in the country’s wealth of material and visual culture. In the proceeding years trade links between Japan, Europe and America were firmly established with Japanese wares being exhibited widely at a number of international fairs, a phenomenon that peaked in the European and American ‘Japonisme’ craze of the 1870s. The demand for things Japanese is one that, even today, does not seem to have diminished. In the present selling exhibition, a comprehensive selection of woodblock prints from the last two hundred years will be displayed alongside contemporary ‘manga’ works. The term manga is largely used to refer to contemporary works of animation from production studios, however, it has a long and varied history in the visual culture of Japan, and some may argue it has roots in antiquity. In early 19th Century Japan, manga fed the aspiration to collect and own. Conspicuous consumption in urban life was a growing trend with an increasing number of merchants in the cities. Manga, or 'comics' in translation, were originally in book format, or sequential multi-colour woodblock prints collected and bound; manga were picture books for adults based on various themes or subjects, both fiction and non-fiction, secular and sacred. The market for collecting manga in late 19th Century Europe and America was not dissimilar, though by this period, prints made in Japan were understood to be of value to western audiences. 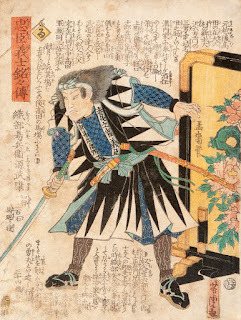 The text located in and around the imagery, as seen in Yoshitora Utagawa’s depiction of Samurai Oribe Yasubei Minamoto no Takeyasu, was integral to its interpretation. In most cases text was weaved into the visual concept. Therefore, the knowledge and education needed to determine meaning demanded an elite audience, unlike the popularized contemporary manga of today. 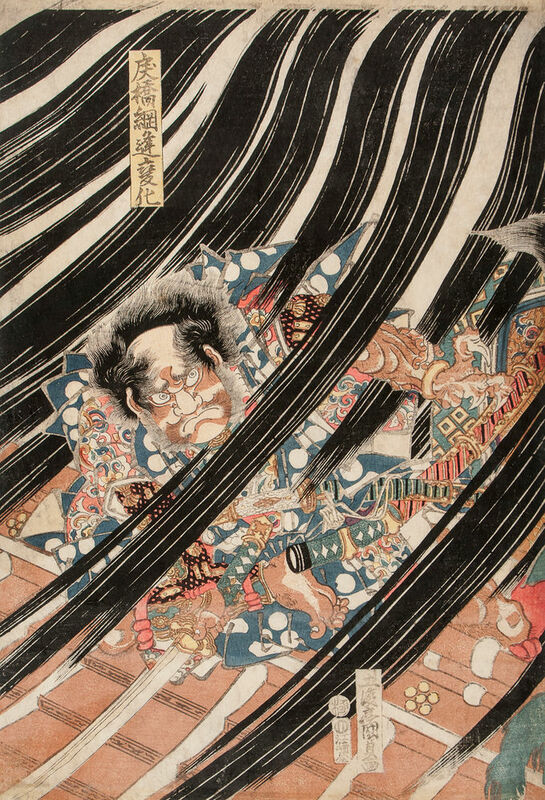 The exhibition commences with a vibrant work from c.1815 by Tokokuni III (1786-1864), depicting the hero Tsuna fighting the apparition of the Ibaraki demon. 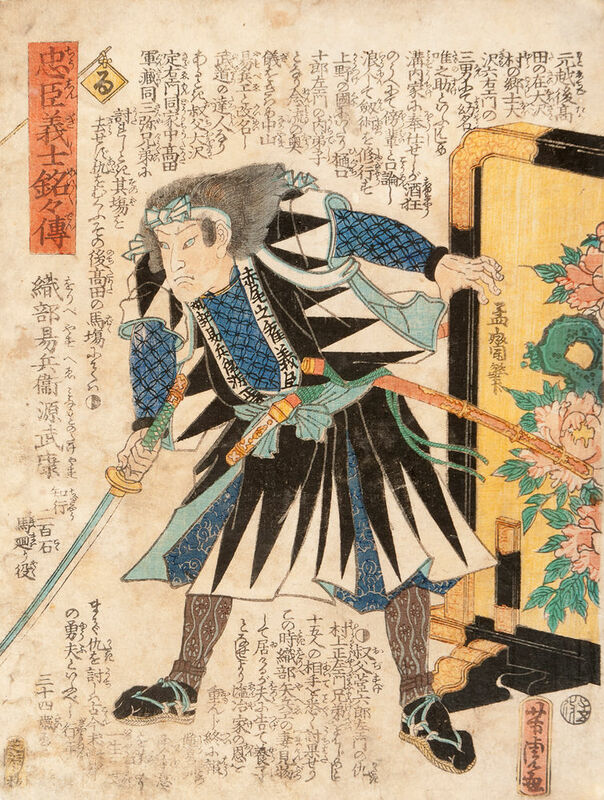 The character is engaged in battle holding a warrior posture. His multifaceted dress describes a weight while the space around him creates a fluidity of motion, while the character seems suspended in animation, caught in a net of bold black line. 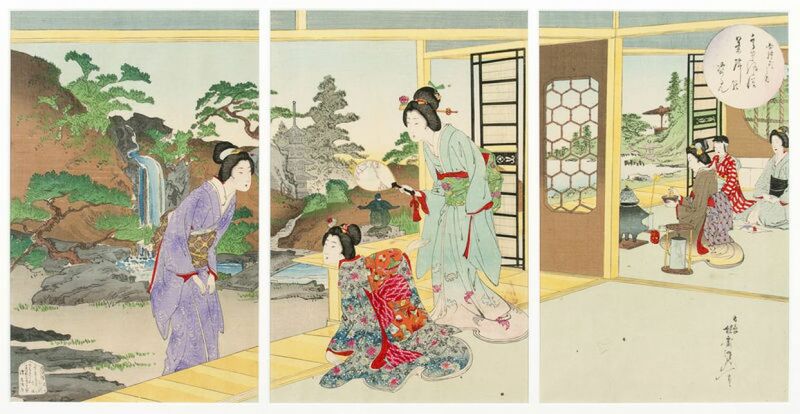 It is easy to see how these prints were known as ukiyo-e, or ‘pictures of a floating world’. A work by one of the of most well-known masters of the genre, from a later period, Toyonobu Utagawa (active 1859-1886), is a depiction of the warrior Nitta Yoshisada, head of the Nitta Clan, engaged in a battle running amidst the fury of archery fire. 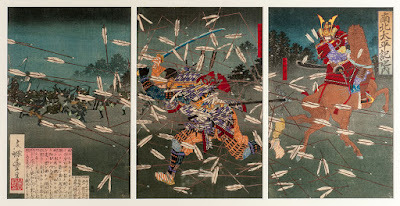 It is a scene from the Taiheiki, a fourteenth-century epic; a primary source for the revisualising of the epic battles of earlier centuries; emphasizing the antiquity of manga and its sources. The dyptych or polyptych composition is highly typical in manga, with the narrative cycle being told across several prints. However, this does not mean that the prints fair badly when viewed in isolation of other parts of the narrative. The individual prints are dynamic and ensure the viewer is critically engaged yet anticipatory of further scenes; the ideal premise for the formation of collections. The development of animé is a logical conclusion of the epic narratives of earlier manga, and the production studios pursue cinematic qualities present in the genre. 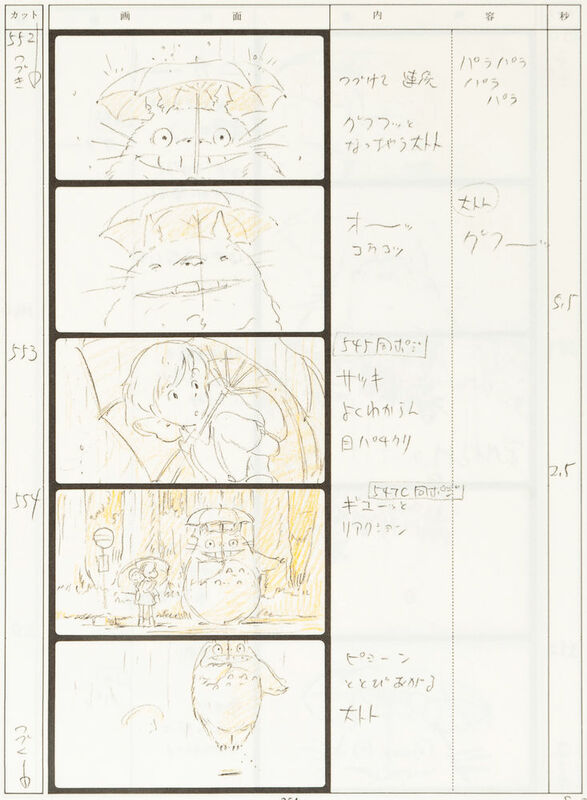 The work of writer and director, Hayao Miyazaki, in his My Neighbour Totoro, demonstrates the twentieth-century extension of manga’s visual language in Japanese culture. 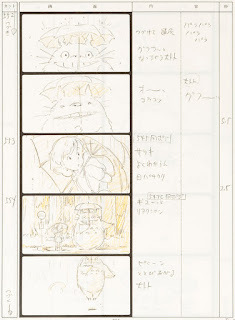 The fracture of narrative scenes, as a product of Studio Ghibli’s storyboard format, are especially useful in understanding the intention of prints from earlier periods, whereby separate parts cumulatively relate to the whole.